Wario World is Wario's solo debut on consoles. As far as Wario games go, it's pretty short. 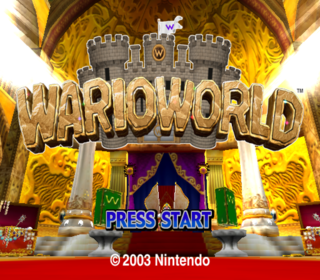 With only eight levels full of re-skinned versions of the same enemies, the game can be somewhat tedious, but the wacky and over-the-top mayhem that Wario can inflict on them makes up for it. This debug menu contains a sound test and a level select. In the bottom right corner is a date of some kind (most likely a build date), set a little over four months before the game's initial release. A basic level select which can be used to access general areas and certain special scenes, such as the title screen. Most of the entries use a naming convention of a letter followed by two numbers – for example, "F21". The letter indicates the type of the room, with "F" for stages, "R" for bonus rooms, "B" for stage bosses, and "P" for Unithorn lairs. World bosses (such as Dino-Mighty) are listed as stages. The first number indicates the world, and the second number indicates the level. Interestingly, there are no entries for World 3, and the third world in the game is given the number 4. In addition to all these, there are three other entries that seemingly do nothing: LAUNCHER, IGNITE, and LOADER. The menu is controlled using the D-Pad of Controller 1 to scroll through the list, with Start activating the selection. Because of how the bonus rooms work, they will not load properly when chosen. This means that either the sky or room geometry will not load, causing Wario to fall into a black void upon spawning. Some objects still seem to load. A very basic sound test menu that lets you not only listen to all of the music and sound effects in the game, but also adjust the playback volume. The first number displayed is the track/sound number, and the second number is the volume level. The volume value starts out at max, with a value of 127. The menu is controlled using the Control Stick of Controller 1, with Up/Down switching between music and sounds, and Left/Right changing between tracks. A starts the music/sound, and L/R will lower or raise the volume for the current selection. The volume levels for sounds and music can be adjusted independently of each other. This portion of the menu is used to test three-dimensional rendering of sound effects, and is controlled entirely using Controller 2. The position of the sound is specified by a set of three coordinates, which can be adjusted using the Control Stick (Left/Right for first coordinate, Up/Down for third coordinate) and L/R (for the second coordinate). A measurement of the distance from the emitter to the camera is displayed above the coordinates. The sound effect used can be changed using Left/Right on the D-Pad, and volume falloff presets can be changed using Up/Down. These presets affect the rate at which volume drops the further away it gets from the camera. There are 18 presets in total, and do not seem to be in any order. 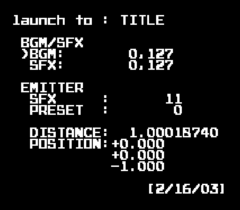 The sound effect can be played using A, and Start will reset the coordinates back to default values. Starting at 001CAFAD0 in the NTSC rom is the string pool for Wario World. Contained in this pool are items that are defined within the game's localization engine, but are not used. ID 6 in the Sound Test. It's named data_0 internally, so it's likely an unused file select theme. option_0 is the used file select theme. ID 19 in the Sound Test. Internally named kobito_0. "Kobito" means "dwarf" in Japanese, and, as the Spritelings resemble dwarves, this theme was likely intended for them at some point. ID 29 in the Sound Test. Internally named sabaku_0. "Sabaku" means "desert" in Japanese, so it was likely intended for Pecan Sands, the only desert area in the game. The pause menu theme is quite possibly one of the most annoying songs in the history of video games, but if you're willing enough to put up with Wario's annoying song for a whopping 50 minutes, not only will he stop singing, but after a while he'll actually apologize to you for annoying you for nearly an hour. A certain ledge in Shivering Mountains cannot be grabbed at all in the Japanese version, making it a bit harder to skip a certain portion of the level. During the Shivering Mountains Angler Mangler miniboss fights in the US and European versions, by doing a Piledriver Mad Move on one of the Barrel Buster enemies they summon at a height of 3.8, there's a possibility that the Barrel Buster will be destroyed, but its hitbox will still remain. This can be used to beat the Angler Manglers without having to use any other Barrel Buster enemies, quickening the fights considerably. The glitch was fixed in the Japanese version. Some slopes in the game were made more slippery in the Japanese version. It's possible to skip both Terrible Portrait minibosses in Mirror Mansion in the US and European versions due to the invisible walls surrounding the arenas not extending all the way out. The first can be skipped only with the Super Jump glitch, while the second can simply be jumped around. Skipping a fight locks the camera, until Wario enters a sub-level or the boss room. These skips were fixed in the Japanese version by extending the invisible walls outwards and upwards, making it so you can't skip the minibosses at all. One of the sub levels in World 2-2 (Wonky Circus) had its background changed between versions. The international versions have the blocks arranged in two layered circles surrounding the stage, whereas the Japanese version has two vertical "wheels" on either side. The Japanese version shows gameplay demos if you wait on the title screen for around a minute. In the international versions, the game's opening just repeats itself. In International releases, all 8 skulls of damage are dealt by first shattering 5 crystals (containing Spritelings) around the map before doing a Mad Move on the Black Jewel for major damage. This is only true in the first half of the Japanese version, which has 8 crystals. After it loses half of its health, the battle enters a second phase, complete with music exclusive to this release and promo material. The Black Jewel floats down to the arena and Wario must attack it directly until it gets dizzy so he can do a Mad Move on it, all while dodging completely new attacks; most notably shooting a huge amount of treasure chests out of its eye while spinning in place. Other attacks include circling Wario to trap him in a circle of fire, slamming into the ground for shock waves, and directly charging at Wario. Additionally, the Japanese version added a rough bumpy effect to the edges of the Black Jewel when it takes damage from attacks over time, letting the player know that their tactics are having an effect. The Black Jewel also does a new animation after each big hit it receives, retracting its arms and spinning as it glows as a way to repair the rough edges. This page was last modified on 15 March 2019, at 16:15.